The Jerusalem tour, organized by the Jerusalem Tourism Authority, will include visits to some of Jerusalem most iconic sites in addition to couple of the tech centers. between the travel companies and startups. by a tour to explore the local tech ecosystem. is a 4-day event for startups that takes place during TTI in Eilat. Participating corporates will fly to Eilat for the final pitch day. Eilat, the southern resort city on the red sea shore. Innovation can be a complicated and expensive endeavor. Hotels often have similar needs technology-wise, regardless if they are independent, part of a small local chain, or part of large international ones. With limited resources and know-how, and no economy of scale, can the small independent properties compete and get access first to new technologies or are they always going to be the late adaptor? Does it even make sense financially to try and innovate or is it better to take the “wait and see” approach? From an innovation perspective, what conditions may turn operating in a small controlled environment result in advantages such as agility and ability to react to customer needs faster? In this panel, we will hear what the needs and challenges of the small operators are and how do they innovative in a cost-effective way. Co-working space, shared rides, and shared accommodation are among some of the trends of the sharing economy that drove the hospitality industry to re-think traditional lodging and reconsider hostels as a high-yield alternative business model that appeals to the growing segment of millennials. Focusing on the public space and on creating a safe, clean, secure, fun, and hip environment, while very affordable, the industry brought back the traditional hostels in a new incarnation. They came back to life in different shapes and sizes and with different offerings, ranging from high-end private rooms to co-ed dormitories with very little privacy. In this panel, some of the top operators in the world will talk about their unique needs and challenges and how they use technology, particularly how they incorporate emerging technologies into their innovative and fast-growing business segment. Serendipity, personal relationships, love at first sight. A mixed panel with operators and startups will give us a lighthearted take into how hard work, professional background, and technical knowledge may have translated into the magic touch that made things happen. The panel will share back stories of innovation partnerships that worked, including how did they found their innovation partners and how they overcame challenges such as cultural gaps, time zone organization, differences in corporate, culture and other “softer” difficulties on top of the pure technical challenges. In addition, panelists will look into personal qualities in theirs and their partner’s teams that may have come into play to ensure the success of innovation initiatives. Starting with a quick look into how cyber security evolved in hospitality, we focus on how top management commitment to it, discussing what are the most urging practical concerns and priorities. This panel will also discuss with experts in the field of security how to prepare travel companies for the unexpected and how to reach a position where companies can be comfortable meeting customer reasonable expectations, without succumbing to disproportionally high costs or sideline efforts. What is the future of corporate travel? In this panel, small and large operators will examine the trends in the business and discuss the main challenges that keep them up at night. They will discuss disruption and changes in business travel, and how technologies can help corporate travel companies bring value to their clients. The panel will also examine the huge changes in SMB (small/medium businesses) corporate travel, a hot area now with large investments in startup companies such as Trip action and Travel Perk, discussing whether the big players are going to control different segments of the market or whether there still space for regional and local players. Consolidation and OTAs are two words often together. This panel will discuss the different developments and new turns in consolidation in the travel business. Examining new deals such as Booking’s FareHarbor purchase, we will talk about the new opportunities and new areas where consolidation is heading, such as AI, big data, content, technologies, and product offering. The panel will also discuss OTA’s strategies for improving their product, and how they set themselves to keep in the current edge of disruption. 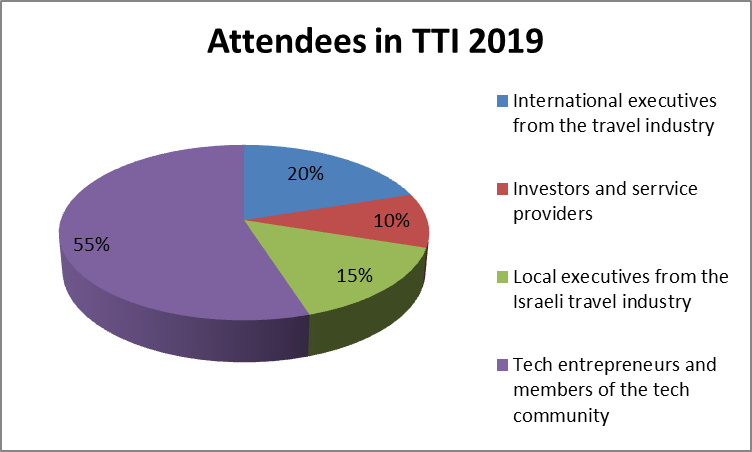 TTI 2019 main event will take place June 11th at the Israeli Innovation Center in Tel Aviv, Israel and will host professional panels and discussion on various topics such as: hostels, corporate travel, small chain and independent hotels as well as big international chains, digital distribution, cyber /fraud, airline challenges, success stories, and more. This year, we are expecting more than 400 people, of which 55% are tech entrepreneurs and members of the tech community, 10% are investors and service providers, 15% are local executives from the Israeli travel industry and 20% are international executives from the global travel industry (hoteliers, travel agents, OTAs, corporate travel managers, airlines, travel management companies and more).